Intellipacks: Technology-specific Bundles, Reducing Time-to-value from Weeks to Hours. 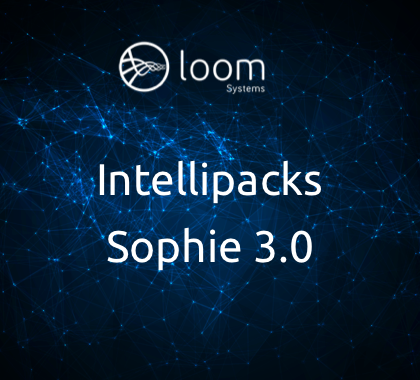 San Francisco, October 22, 2018 – Loom Systems' AIOps solution, which predicts and prevents problems in digital businesses, announces today at the Oracle OpenWorld 2018, the release of Intellipacks, technology-specific bundles as part of the Sophie 3.0 AI-engine. The new release takes in mind companies undergoing cloud migration, enhancing capabilities around emerging clouds such as Oracle’s Cloud Infrastructure. Intellipacks combine the support of common technologies, crowd-wisdom with clear visualizations. This unique bundle reduces the time-to-value to a few hours of integration. This latest feature aligns the company’s vision and commitment to its customers to not only predict incidents in the IT stack, providing the tools to eradicate future issues, but also provides immediate, real-time response. Intellipacks enable a seamless and easy onboarding, deliver precise monitoring without the need to manually configure dozens of queries and thresholds, reduce alert flood, and finally, provide continuous monitoring accompanied by insight management. Learn how Intellipacks enable your services to become reliable and automated here. Loom Systems’ patent-pending AIOps solution predicts and prevents problems in businesses undergoing a digital transformation or cloud migration. Loom stands alone in the industry as the only solution that predicts IT issues before they impact customers, and enriches them with insights and resolutions in plain English. Loom Systems has been named Gartner “Cool Vendor” in Performance Analysis and has recently raised $6M from leading companies: JVP, Meron Capital and 31Ventures Global Innovation Fund. Visit our website https://www.loomsystems.com and follow us on Twitter @Loom_systems and LinkedIn.